[134 Pages Report] The composite doors & windows market was valued at USD 812.0 million in 2015 and is projected to reach USD 1,171.4 million by 2021, at a CAGR of 6.3% during the forecast period. In this study, 2015 has been considered as the base year, while the forecast period is from 2016 to 2021. Composite doors & windows have good resistance to acids, salts, or any alkali substances. They are even resistant to heat and cold. In short, they can withstand any harsh environmental condition. Their other strong properties like stiffness, sealing, electrical insulation, energy efficiency, and low weight make them preferable options than any other door and window. FRP doors and windows do not degrade easily unlike wood or plastic doors. Their quality, color, and property remain the same for an average of 60 years. Their average life span is more due to the influence of all the properties which the FRP composite has. Due to these properties, they have low running cost. Their requirement for maintenance is very low which saves the cost and makes them more preferred in hospitals, food industry, pharmaceuticals, and so on. For instance, Dortek (Ireland) has developed and installed FRP hygienic doors at two art Spire hospitals. Such developments are encouraging the use of composite doors & windows in various applications, thus driving the market growth. The value chain of the composite doors industry includes manufacturers of resins, fibers, and adhesives. Key players in the composite doors market are Dortek (Ireland), Special-lite INC (U.S.), Curries ASSA ABLOY Group (U.S.), Vello Nordic AS (Norway), Andersen Corporation (U.S.), and Pella Corporation (U.S.). Composite doors and composite windows are used in industrial, commercial, and residential applications. In September 2016, Dortek launched a new hospital door in the range of healthcare doors. The company produces a range of seamless GRP doors that are designed specifically to meet the stringent needs of high hygiene areas within a hospital. As they do not contain timber or organic materials, these doors prevent bacterial growth and maximize hygiene and cleanability. In August 2016, Special-Lite Inc. The company launched BasiX door that includes many of the features of a Special- Lite SL-20 sandstone-textured FRP flush door, with no lead-time, and has a competitive price point. BasiX doors are lightweight and resistant to chemicals and corrosion. This product door can fit into any existing frame, which helps the company replace the product with existing doors in an easier way. In August 2016, Curries, Assa Abloy Group added borrowed lights, aluminum sidelights, and frames to their FRP doors. The new sidelights, borrowed lights, and frames are made from tubular 6063-T6 aluminum. This new product adds advantages such as having lights and side lights to their existing FRP doors. 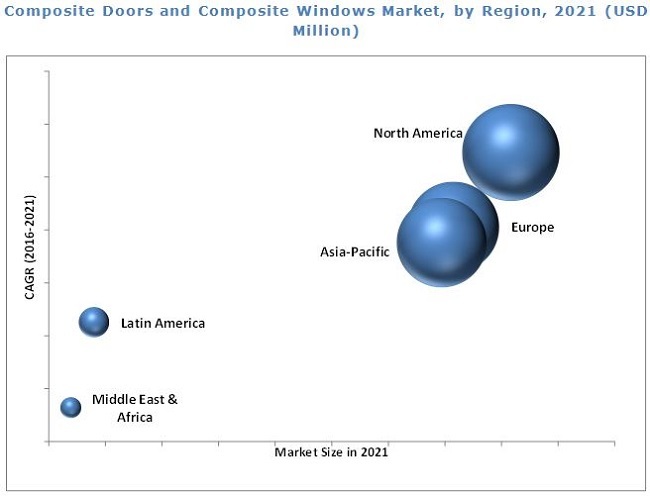 What are the upcoming trends for composite doors & windows market in developing nations? The composite doors and composite windows market is projected to reach USD 1,171.4 million by 2021, at a CAGR of 6.3% during the forecast period. The report covers the market for both composite doors & windows. The growth of this market is expected to be driven by the increase in demand for composite doors and composite windows from industrial and commercial applications. Composite materials are used in the manufacturing of lightweight doors to reduce the overall weight and provide exceptional properties such as resistance to high temperature, corrosion, and extreme weather conditions. Composite doors & windows are widely used in a variety of construction applications due to their superior property of energy efficiency. Composite doors & windows are excellent insulators, which help in saving the energy where they are installed. Composite doors & windows include FRP- and WPC-based doors & windows. Glass fiber is the most preferred reinforcement used for composite doors & windows. FRP composite doors & windows are manufactured through continuous filaments of fiber, which are melt-impregnated with plastic polymer by the pultrusion process to create a high-performance bond. Composite doors & windows are moderately capital-intensive, especially the FRP doors & windows. High investment equipment is required for its manufacturing. New technologies need to be developed to produce low-cost glass fibers and composite doors & windows to commercialize the end products. The development of low-cost composite doors & windows would enable its use in a wide range of applications, where cost intensity is an important issue. In the developing countries such as India and China, the applications that require these composite doors & windows are cost-intensive industries. Hence, the identification and development of low-cost technologies for manufacturing doors & windows are a major concern, globally. North America is estimated to be the largest market for composite doors and composite windows. Presence of some of the major manufactures such as Special-lite INC (U.S.), Curries Assa Abloy Group (U.S.), Andersen Corporation (U.S.), and Pella Corporation (U.S.) is expected to aid the growth of the composite doors market in North America. The U.S. is a key market for composite doors and composite windows in North America. Glass fiber is the most preferred reinforcement used for composite doors & windows. FRP composite doors & windows are manufactured through continuous filaments of fiber, which are melt-impregnated with plastic polymer by the pultrusion process to create a high-performance bond. These are then cut into composite pellets for convenient processing into net shapes via injection molding or extrusion processes. Glass fiber is commonly used as a reinforcing element in commercial and industrially used doors & windows. WPC are the upcoming composite materials that are developing more in the areas of building, furniture, and infrastructure applications. Wood can be in the form of sawdust or wood fibers. The commonly used synthetic resins in WPC doors & windows are polyethylene, polypropylene, or polyvinyl chloride (PVC). Mixing wood flours increases the mechanical and thermal property of the composites. Mixing process is followed by extrusion, where the mixture is converted into the desired product. What are the upcoming hot bets for composite doors & windows market? How market dynamics is changing for different forms in different applications? Dortek (Ireland), Special-lite INC (U.S.), Curries Assa Abloy Group (U.S.), Vello Nordic AS (Norway), Fiber Tech Pvt. Ltd. (India), Andersen Corporation (U.S.), Pella Corporation (U.S.), and Wood Plastic Composites (India), among others, are some of the leading players in the composite doors and composite windows market. 12.10 Fiber Tech Composite Pvt.Ltd. Figure 28 Construction Industry in Brazil Contributes the Maximum to the GDP in Latin America, USD Billion, 2016 vs 2021.